BBC NEWS | Programmes | Analysis | Go Green or Else! 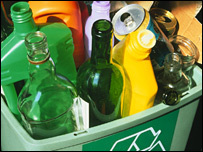 Does household recycling make a difference? BBC Radio 4's Analysis: Go Green or Else! will be broadcast on Thursday, 19 July 2007 at 20:30 BST. The UK government has set a target for reducing carbon emissions by 60% below their 1990 level by 2050. This is a higher target than set by any other country and one which cannot be achieved without serious shifts in the way we deliver and consume energy across heating, lighting, driving, travel etc. All of which will demand fairly drastic changes in consumer behaviour. In other words: politicians are asking us, the public to turn 'green' in less than the time it took to stigmatise drink-driving - if you consider that much of the change must happen well in advance of 2050. While opinion polls suggest that most people in Britain are worried about climate change, there's little sign of action on their part. One of the main reasons for this is that people feel that it won't make a difference to the bigger, global picture whether they themselves recycle, use energy-efficient light bulbs or never keep their television sets on stand-by. It's true that China, for example, has overtaken the USA as the world's biggest producer of carbon dioxide. But it's also true that China has realised that global warming affects them, too and recently the Chinese government ordered that all official cars remain in their garages. Camilla Cavendish asks what the government can do to make us greener and whether our traditional loathing of coercion will stand in the way. Contributors include: David Miliband, now Foreign Secretary but until the recent re-shuffle Secretary of the Environment; the polling organisations "Populus" and "Ipsos- Mori" and several environmental experts across the political spectrum who make some surprising suggestions. Should people pay for new organs?